‘Tis the season where geeks and wannabe geeks ask their friends and loved ones for those things that haven’t yet bought themselves. For those who haven’t had a chance to buy Map Scripting 101 yet, I’d love to give it to you. Since I can’t give it to everybody, I decided to create a simple way to choose someone. I call it Wishful Mapping. You add the book to your Amazon wishlist, then share it with me. I’ll randomly select someone to receive a copy of the book as a gift from me. And, of course, there’s also a good chance whoever else you share your wishlist with will get it for you. 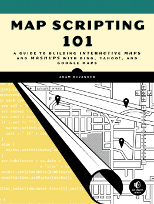 To get started, go to Map Scripting 101 at Amazon. 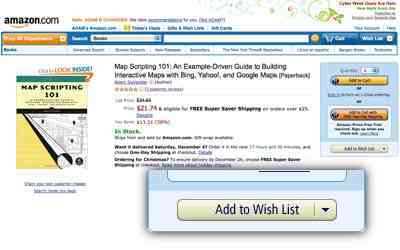 Look for the Add to Wish List button. After you’ve added the book to your wishlist, look for the Share With Friends link at the top of your wishlist. 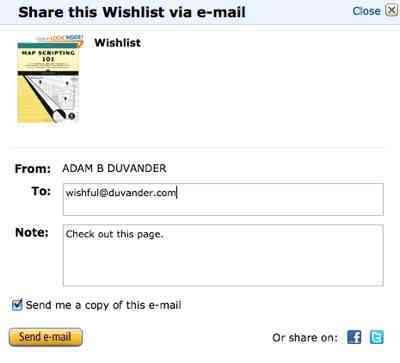 Include wishful@duvander.com in the To: section. Increase your odds of receiving the book by including your the email addresses of others who might give you a gift. Only Amazon sees their email addresses. And that’s it. Later this month I’ll select a random Wishful Mapper to receive Map Scripting 101 for free.